Dimsok: the download link is in a box centered below the MD5 box under the paragraph of text below that, at the link he sent. Use Google translate if you can't spot it. That said, I don't have any idea what this plugin does and have not downloaded it myself. Can't see any download link except advertisements. Such hosting services make me crazy. I've downloaded and added the file as an attachment. Remember to unzip it using Winrar/7-Zip. Let us curious ones know if it does what you wanted it to do. Assume you select an ARTIST with four ALBUMs (using Facets or AlbumList or what else) . Using "Run services per group" all tracks of *all* albums are transfered i.e. to mp3Tag. Using "Run service" only all tracks of the *first* album are transfered. For me doesn't work. Open selected tracks, then run service, opens only one track. You have to use Run services per group instead of Run service! For mp3tag is this the best part variable to use for the per group plugin? I would like to load files by filename not album. I can't get it to work like that. Cheers. I do not know about you but sometimes I like to hear albums in my library—and not new music—that I did not rate or I rated with 4< but still be possible that Spotify recognize the album as one I like/listen—not listen to it on Foobar—. So, whatever it is your reason to do it with this code you can search "ALBUM - ARTIST" in Spotify web. Yes, the avatar it is the cover of «The City» by Vangelis. Now that I did make it—after a year trying now and then—I finally got clean up my Run Services menu as in the image. And if you want to check the parameters for each service I did a .txt file. And I copy the text in case you want only a bunch of them. "C:\Program Files\AlbumArtDownloader\albumart.exe" "%artist%" "%album%" "$replace(%_path%,%_filename_ext%,)%artist% - %album%.jpg"
This will load the whole directory of the audio file in question into Mp3Tag. It's just a bit cleaner for editing whole albums. I gave up on that one but now, as you say, it loads the whole directory with no problem. Another one; in RYM when you search for an album probably you will not get it on top of the page and even sometimes you do not find it if you misspelled it. 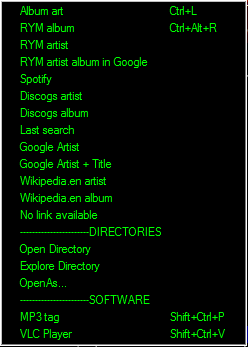 With this one, you will search in all releases ["album" "artist"] so if you do not get the album—the less common thing as I have tried a lot and you usually get the result—you will have the artist which you can click so you do not have to use Google RYM artist album another code I have made and posted. It is annoying having to "go outside" RYM. and manually saving it to an .m3u to be used in mpd on linux. I'd like to be able to just hit a keyboard shortcut and have a save dialog open with my properly formatted playlist ready to be saved if possible. Thanks. This foo_run is such a helpful component, no idea how I ever used foobar without it! 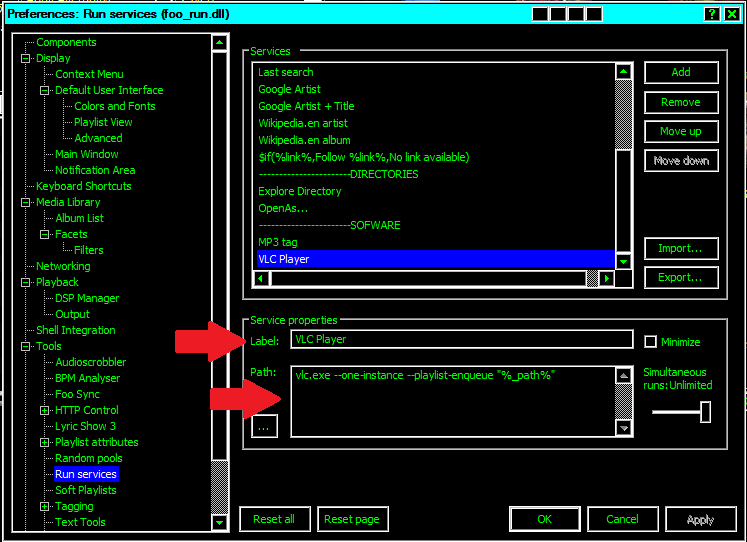 how can I use foo_run to open a file from the playlist with the default application defined in windows? It works for albums with spaces the thing is that my string retrieves all the results—as in a regular search in Google. Because of the different versions of albums, sometimes more than twenty, that it can coexist in Discogs, I prefer to search as in Google. Does the version with underscore allow some extra flexibility? I am using Windows 7 SP1 if that matters. I'm curious as to why folks use "%_path%" (with preceding underscore) instead of just "%path%" . Sure thing. My thinking was that once you click on master release, you then get all releases sorted by date with catalogue numbers etc. But either way works. Does anybody know how to archive the same with linux/wine?